The Library is a fun place central to the school community. The main focus is to provide an enriched motivating environment where students will learn a love of reading and knowledge. The Library provides quality literature, encouraging a recreation reading culture in the school - one where children love to learn. Classes are time-tabled to visit the Library each week, to browse and exchange books for borrowing. It is open to students at lunchtime for a variety of activities. 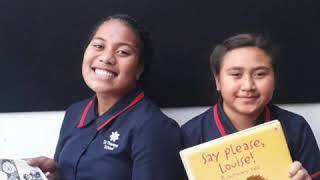 All Students are encouraged to borrow books and take them home to read, they may borrow two books at a time and these are loaned for two weeks. If you need to borrow a book for longer please speak to Mrs Paterson. St Therese School were fortunate enough to have Daniel Faitaua from Breakfast TV and Midday News join us at our assembly as our Duffy Role Model. Thank you, Daniel, for sharing your love of reading and inspiring us to pick up a book. This was a fantastic start to Book Week. Mt Roskill Library kindly invited some of our students to celebrate Enkutatash- Ethiopian New Year, by attending an Ethiopian Storytime and Morning Tea session. Dressed in their cultural clothes, our students learned about traditions carried out on this special day and participated in cultural dancing. It was an amazing event and we thank the wonderful librarians for including us in the celebrations. Our first ever Book Character Costume Day was a blast. It was great to see everyone dress up and take part. Thank you to all the family members who helped create costumes for the day and to those who came along and joined us. The runway was filled with many different character costumes at our Book Week Costume Parade. It was amazing to see everyone have a chance to share their creative and captivating costumes with the rest of the school and whanau community. Our wonderful judges from Mt Roskill Library had an extremely tough job and we thank them for being part of this fun-filled day. There was no better place to be than in the school library during our fun-filled 'Book Week'. We love seeing our students jump into the world of books. Mrs Paterson organised and ran a whole range of activities during break times and class library sessions. We are truly fortunate to have such a dedicated librarian and a beautiful school library.